Sophie Elliott had everything to live for-- good looks, intelligence, friends, a loving family, a degree under her belt and a new job at the Treasury in Wellington. And then, the day before she left Dunedin to take up that job, she was brutally stabbed to death by her former boyf... read full description below. Sophie Elliott had everything to live for-- good looks, intelligence, friends, a loving family, a degree under her belt and a new job at the Treasury in Wellington. And then, the day before she left Dunedin to take up that job, she was brutally stabbed to death by her former boyfriend, Clayton Weatherston. He was much older and a tutor at the university, and when the public came to take his measure at his high-profile trial in 2010, his narcissitic, manipulative personality stunned the nation. Sophie's mother Lesley has overcome the horror of her daughter's death and the gruelling process of the trial to set up a foundation to help young women identify when they might be in a relationship that puts them in harm's way - as Sophie was, unbeknownst to her and her family - and how to seek help. This book is her tribute to a daughter she adored, her harrowing account of a tragedy no family should ever have to endure, and her inspiring decision to make sure that Sophie's legacy endures. W. J. (Bill) O'Brien, a retired former senior police officer, is the author of over 20 books, including one on the Aramoana shooting tragedy that subsequently became the basis for the film Out of the Blue. He co-authored the bestselling Sophie's Legacy with Lesley Elliott, her account of the murder of her daughter at the hands of ex-boyfriend, Clayton Weatherston.His prolonged trial and attempts to blame Sophie for her own death created huge public revulsion and outrage. The case caused further controversy with the use of the defence of provocation leading to call for legal reform. Royalties from the book go towards funding the Sophie Elliott Foundation, which has been established to resource a school-based programme to better prepare young people to look after themselves and avoid abusive relationships. Bill is now a trustee on the Foundation and manages Lesley's nationwide speaking engagements in a voluntary capacity. He was a finalist in the Junior Fiction category of the New Zealand Post Children's Book Awards of 2007, and soon after was appointed Children's Writer in Residence at the University of Otago's College of Education. 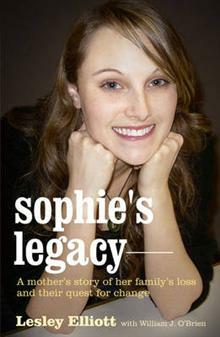 Lesley Elliott wrote the memoir Sophie's Legacy in memory of her daughter, the late Sophie Elliott. She lives in Dunedin and is the founder of the Sophie Elliott Foundation (www.sophieelliott.co.nz), which has been established to resource a school-based programme to better prepare young people to look after themselves and avoid abusive relationships. Sophie's murder in January 2008 captured the nation's heart, and led to one of the most keenly followed murder trials in New Zealand's history, when Sophie's former boyfriend, Clayton Weatherston, was tried and convicted of murder. The case caused further controversy with the use of the defence of provocation leading to call for legal reform. Sophie's Legacy was co-authored by W. J. (Bill) O'Brien, a retired former senior police officer who is the author of over 20 books, including a book on the Aramoana shooting tragedy.